Mediterraneo is based on an old recipe used at the Monastery of St. Giacomo, and was reconfigured for the Italian line Carthusia by nose Laura Tonatto. The fragrance launched in 2002, and features notes of lemon leaves and green tea. Mediterraneo starts with tart, juicy lemon and lots of green: crushed green leaves, dried green tea leaves, lemon verbena, and maybe even a hint of lime peel. The green tea intensifies as it dries down, and there are vague hints of other fruits and light florals. After a hour or so, it gets ever so slightly soapy, but it is not at all harsh or aggressively clean. I have never been to Capri, but this is what a Mediterranean island ought to smell like. It is bright and fizzy and exuberant, and probably the fragrance I reach for most often in the summer. If, like me, you detest cold weather, it is also the perfect thing to wear on a dismal winter day when you need a little reminder that summer is not so far off. Mediterraneo is an Eau de Toilette, and it is not long lasting, but nor does it go flat and stale within the first 30 minutes as many lemon fragrances do. It was the first fragrance I ever bought unsniffed, and it was a resounding success: it is one of very few bottles in my collection that is emptied and replaced on a regular basis. Unfortunately subsequent efforts to buy unsniffed have by and large been a disaster. I should have stopped while I was ahead. Mediterraneo is available in 50 and 100 ml spray bottles. 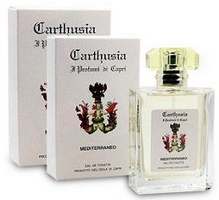 For purchasing details, see the listing for Carthusia under Perfume Houses. I think the house is generally under-appreciated R. As you know I am not a fan of citrus in general but Meditteraneo was pleasant. I favor the Carthusia floral – Fiori di Capri but only in the winter since it is quite heady and would be overwhelming in the heat and humidity of summer. Huh – now that I think of it, I find I reach for Fiori during bleak winter days as well – maybe that is the hallmark of a Carthusia Cheers! F, I need to try the Fiori again, I can hardly remember it, but agree that the line is not as popular as it should be, and same with Laura Tonatto's own line under her name. Great review! Mediterraneo was the first citrus fragrance I truly liked. I do not care for any others in the line, though. V, I tried to like Uomo but gave up. It just doesn't captivate me. Io Capri was too soapy for me. I would love to know if Laura Tonatto is still doing the scents. I know from WWD that she did the first 4, but haven't seen anything about later additions to the line. I am not sure about it. I only know that she made a few for Carthusia and obviously her own. Nothing really captivated me either. In my humble opinion, Uomo needed more of everything: more raspberry, more rosewood, more kelp. It was as though they created it for a man who didn't really want to wear much fragrance. An “extreme” version might be more to my liking. R, Like you I detest cold weather !!! I like Mediterraneo, but don´t love it. It has a vague mint smell to me (though that doesn´t seem to me in the notes you mentioned) & I don´t like mint very much. The staying power on my skin was very good though. I´m not too much into the Carthusia scents in general – they just don´t thrill me & I was really disappointed when I smelled Lignea for the first time, way too perfumey for me. Io is rather nice, but also no must-have for me. S, I have seen both mint & pear mentioned in reviews, and wouldn't be surprised if both are in there. I definitely smell something fruity, but can never decide if it is really pear. Something like it, certainly, and obviously there is lots more than lemon leaves & green tea. I don't pick up on the mint, but wouldn't mind if I did! I don't think I have tried the Lignea yet. R, I would be a bit surprised if you liked Lignea, but it ´s certainly good to try it anyway ! I´d like to try Fiori, but haven´t had a chance yet. Hi R! I really like this, at least I think I do, from the sample I tried. I was given L'Occitane Green Tea to compare with it, to see if I thought they were similar — and I do! Do you think so? They aren't twins but enough alike for me that I could go the less-expensive route, if I decide I need it. Hi G! To my nose Mediterraneo is more about the lemon than the tea, and the L'Occitane is more about the tea than the lemon. I do like the L'Occitane, but don't love it. It isn't as zingy (silly word!) and it has just a little more sugar than I'd like. Also probably more floral notes, if I remember correctly. But it is all about personal taste, no? I gave the newer L'Occitane Mint Tea a quick spray on a card, but mean to try it on skin one day and see if I like it better. I don't care for the L'Occitane at all, but I love Mediterraneo. I also love Fiori di Capri, but the rest of the line leaves me underwhelmed. T, You're the 2nd person to mention Fiori so I'll need to get myself over to Barneys and try it again. I know that it is one of the original Carthusias that was done by Laura Tonatto. So sorry you didn't like it! I don't know that tea so I'm not going to be any help at all, I'm afraid. Robin, as the weather seems to be surprisingly glorious at the moment here in the UK, I'm currently after a summer scent. I tried Mediterraneo but was somehow too citrusy for me (or maybe because it was the EDP I tried?) I am debating on either Sur Le Nil or The Pour un Ete but then again afraid of the citrus blast I might get. Which would you recommend? I am also debating on whether I should get a bottle of Iris Nobile (not a floral lover but I love Iris) but as I am not blown away I continue to search for a summer staple before deciding. I love musk, incense and vanilla (although not too gourmand) notes. Medit. is pretty much based on citrus. Jardin Sur Le Nil — very citrusy, but less so than Medit, and not so single-minded about it. The Pour Un Ete, only a tiny touch of citrus. Have you tried Eau d'Italie Paestum Rose? I think that might be a perfect summer scent for someone who like incense.